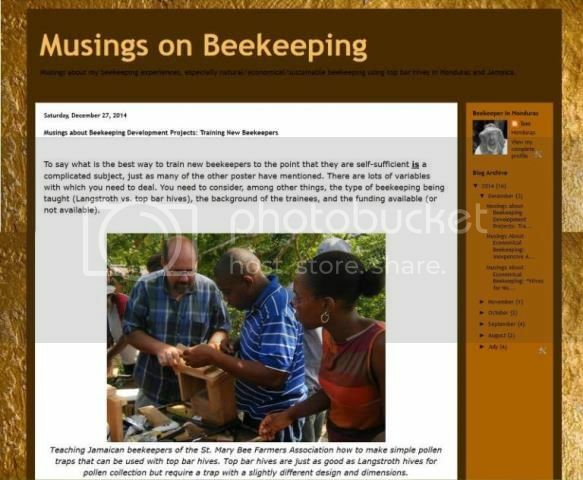 Beekeeping is just about the perfect income-generating project for developing countries. It’s one of those activities that should always come up when ideas are thrown around about how to help the economies of impoverished families. It has numerous advantages. A nice profit can be made from the sale of honey. It doesn’t have to be done full time so it can be done in addition to a normal job or in addition to attending the other crops and animals on a farm. But it can also effectively be a primary income source. It’s gender neutral since it can be done as easily by women as by men. And you can begin it for practically nothing if necessary. But the one common factor is that there needs to be some sort of effective training of these new beekeepers if you want the project to be sustainable. This is something I’ve been involved with in one way or another ever since I came to Honduras just about 25 years ago. In that time I’ve seen and heard about beekeeping development projects done well—and not so well. Training these new beekeepers was the topic of a recent discussion on the TECA site of the United Nations’ Food and Agriculture Organization (FAO). TECA is an information platform of technologies and practices for small agricultural producers where there had been this discussion about “how people learn skills to become effective and profitable keepers of bees. Since the topic always interests me and since I’ve been involved in beekeeping development projects and training beekeepers, it got me thinking. Here are my musings about it.